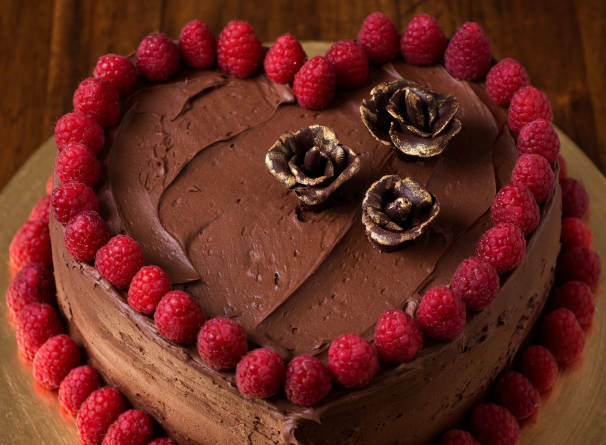 Pair with the Bittersweet Chocolate Icing and Edible Chocolate Roses, from the Altitude Adjustments article in the February 2017 issue. This old-fashioned, moist chocolate cake has a fine grain and tender crumb. It is sensational at sea level and made-to-order for high elevations because it contains buttermilk, a favorite high-altitude ingredient that contributes moisture and tenderness as well as extra acidity to help the batter set quickly. For Valentine’s Day, bake it in heart-shaped metal cake pans (see recipe instructions). Fill the layers with your favorite raspberry jam and frost with Bittersweet Chocolate Icing (recipe follows). This recipe is written for sea level, with altitude adjustments in parentheses. Position the rack and preheat the oven: lower third and 325° for sea level; center and 375° for 3,000–5,000 feet; lower third and 350° for 7,000 feet. Coat two 9-by-1-inch metal round or heart-shaped pans with butter-flavor vegetable spray or shortening. At 5,000 feet and above, line with baking parchment or wax paper. Grease again, then dust greased pans with a bit of sifted cocoa powder; tap out excess. Put the chocolate in the top of a double boiler set over simmering water (at sea level to 3,000 feet) or boiling water (5,000 feet and above) and heat, stirring occasionally until smooth. Remove from heat and set aside to cool. In a medium bowl, whisk together the flour, baking soda, salt, and nutmeg. Set aside. In the large bowl of an electric mixer, cream together the butter and sugar. Scrape down the bowl and beater. Beat in the vanilla and then the eggs, adding them 2 at a time. Beat well, then scrape down bowl and beater. With the mixer on the lowest speed, alternately add the flour mixture and the buttermilk. Stir the chocolate to make sure it is smooth, then scrape it into the batter and beat until no streaks of color remain. Divide the batter evenly between the two pans; smooth the tops. Bake 35–45 minutes for sea level; 25–27 minutes for 3,000 feet; 25–30 minutes for 5,000 feet; and 30–32 minutes for 7,000 feet—or until the cakes are springy to the touch and a cake tester inserted in the center comes out clean. Cool layers in pans on a wire rack 10–15 minutes, then run a knife along the sides. Top each with a foil-covered cardboard cake disk or a plate, invert, and remove the pan. Peel off the parchment, if used, and cool layers completely. Fill and frost as desired.